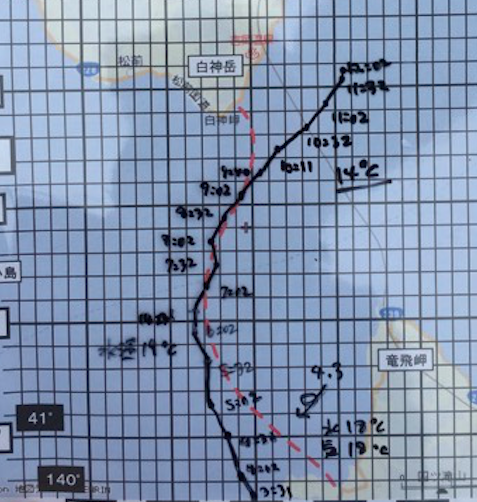 Four years ago almost to the day, Brad McVetta of New York attempted his first crossing of the Tsugaru Channel in northern Japan. After 17 hours 13 minute across and against the Tsugaru Current, he ultimately gave it his all, but did not finish. While the conditions were acceptable and the water temperature was comfortable at the start of his second attempt today in Japan, the elements in the Tsugaru Channel proved too much again for McVetta. As he approached his goal of Hokkaido, he had to fight against the strong Tsugaru Current that pushed him away from his goal. He also faced water temperatures that steadily dropped from 19.5°C at the start near Honshu to 12°C at the end near Hokkaido. The Tsugaru Current whips around the southern edges of Hokkaido around Shirakami Misaki and kicks up some large, unpredictable eddies that draw up the colder water from the depths to the surface. It is a double punch that has taken down more than one experienced channel swimmer.